Pizza lovers unite! A great lighter style meal, swapping a traditional base for a light, thin potato and cauliflower base. In a pot bring water to boil. Once boiled remove from heat and whisk in KNORR Potato Flakes GF and CONTINENTAL Professional Gluten Free Cream of Cauliflower Soup Mix. Set aside. Sift the flour and baking powder into a bowl, add the potato mix and herbs and stir to combine. Add the milk and mix to form a soft dough. Turn onto a lightly floured surface and knead lightly to form into a smooth ball. Place on a greased baking sheet. Press out evenly to a 23cm/9" round. Put into the oven 225 degree Celsius / Gas Mark 7 to bake for 10 minutes. Remove the pizza base and lower the temperature of the oven to 200 degree Celsius / Gas Mark 6. 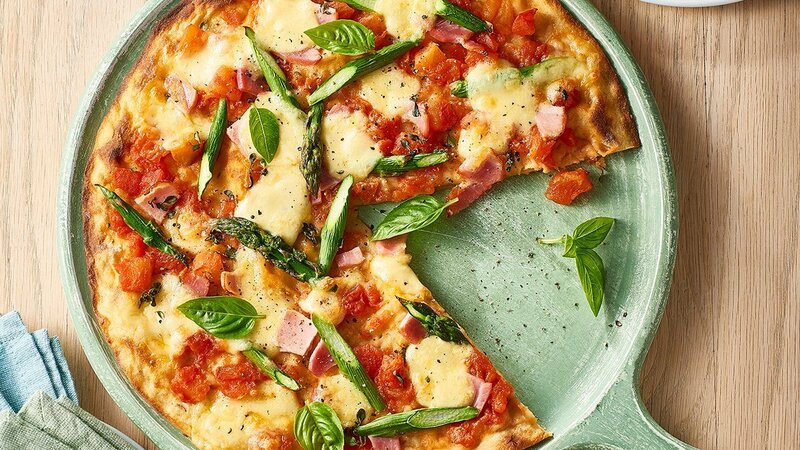 Spread the KNORR Gluten Free Pronto Napoli over the base and top with Asparagus, Bocconcini and Bacon. Sprinkle with thyme leaves. Return to the oven for 8-10 minutes until the cheese has melted and the edge of the base is crisp.